To All The Wonderful Moms! We could not ask for more perfect Spring days like we have been having, a perfect time to spend outdoors with friends and family for a wonderful Mothers Day weekend. We are really looking forward to having friends and family to enjoy the holiday with us and wishing you the very best weekend with your loved ones. I am so happy that you could stop by today, spending time with you is very important to me and I really look forward to your visit. Wishing you the very best for this weekend and come back to see me real soon! 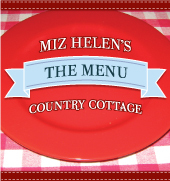 Your menu looks delicious as always Miz Helen. May you have a very happy Mothers day. Happy Mother's Day! The menu looks delicious this week! What a great looking menu!